When I first saw Jane Eyre dear reader (that's right, I saw a version before I read the novel), I thought St. John Rivers was a shocking shell of a man -- cold, intellectual, and everything completely opposite of Rochester. And then when I read the novel, my opinion was only solidified. Now that I'm older, I wonder why this is. Why do we think that St. John is such a awful person? Especially with the newest version of Jane Eyre, I think it more apparent St. John might be horribly misunderstood. Can we really denounce someone for choosing his work over love? Or believing he and his life will not fit the girl of his dreams? I pose we look a St. John just a little deeper and consider he's more likable than he first my seem. Jane Eyre, as well all know, is a first person novel. Therefore, we are always in the mind of Jane. Really, Jane's thoughts, opinions, and beliefs are all we care about. I'm sure if the novel wasn't full of her inner thoughts we wouldn't love Rochester as much, or understand how important nature is to her. Thus, her reaction to St. John is colored by her own beliefs and opinions. To Jane, St. John is cold and calcualting -- brilliant but un-nurturing, and deeply lacking in passion. She is continually comparing St. John and his actions to Rochester baisly. After all, she still deeply loves Edward when she is taken in by the Rivers. Therefore, we will never have a fair picture of St. John Rivers, because Jane's view of him isn't fair. By the time St. John appears on the screen or in the novel, we as watchers and readers have already fully invested in the dark and tormented soul of Edward Rochester. How does anyone compare to that? St. John comes at time when we're all waiting for Jane to return to Rochester. Let's face it, her going back is no surprise for us, and so we gloss over the option we know she'll not choose. They're both each other's second choice, and that's never good enough for a Bronte. Jane describes St. John, throughout her time with him, like ice -- immobile, frozen, cold-hearted. Who wants love that? My question is -- is that really how St. John is, or just how Jane sees him? 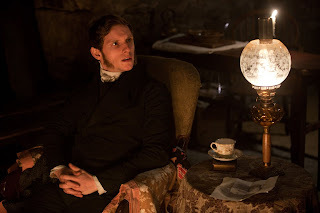 I call in my defense Jamie Bell and his brilliant St. John Rivers (and this kinda goes into my next point as well). Maybe its because we start the movie with the Rivers, or maybe its because St.John is more Jane's age, or maybe its because his undying passion for Rosamund Oliver isn't featured in the 2011 version, but Bell makes me think Jane doesn't give him a fair shot at being a hero. With Jane, St.John continually thinks he must handle her with care, and stays weary of her becuase she is a stranger with no name, and when she needs a reality check, she recoils from his logic -- logic, might I add, that is very sound. He tells her to forget man who lied to her, was willing to force her into a fake marriage, and lasciviously endanger her soul. St. John might be abrupt when he confronts Jane, but its his passionate nature showing through; its just a different passion than she's used to. Bell's proven to me that we've sided a little too blindly on Jane's side about this man. As I stated above, St. John's placement in the the movie or novel is critical. If we start with him, he's more of an option for Jane; he compeats dually with our Rochester for our affections. If he's at the end and the end is cut up for time, then his complexity is thrown away. You must agree, there are a few versions were he is solely used as a plot device and nothing more. How then, are we able to understand him enough to connect to him? It's an injustice done to many characters, and just more often happens to poor St.John. Like Rochester, St.John Rivers believes in educating women - alright he believes women can be educated. And even more so than Rochester, executes this fact. Where Jane is more like a pet (don't make me defend this with bird imagery. I will) to Rochester, St.John sees her as an equal, like his sisters (certainly not the equal in today's standard, but it was 1800's people). I believe St. John and Edward are far alike than we'd like them to be, and it is just a happy (or sad?) coincidence readers take to one and not the other.